How will #ExcelMasterclass benefit me? 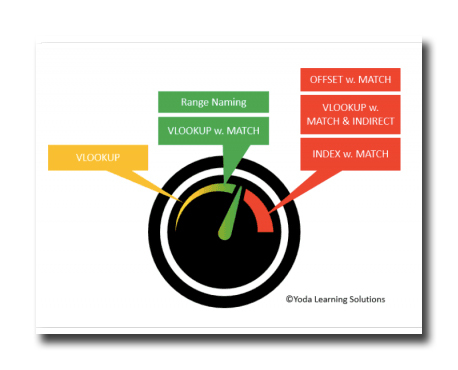 Writing VLOOKUP formula or making Pivot Table will NOT give you the #OfficeHero status. Don’t get me wrong. These topics are must-know. However, they solve basic problems and do not solve complex reporting and data analysis problems. Then, what does? Array formulas, Reverse Lookup, 3-D Lookup, Dynamic Dashboards, Automation using Macros… and more such tricks. #YodaLearning #ExcelMasterClass covers all of these. Re-watching a video is a waste of time, and time is money. If a video can’t make you understand a topic in the first view, it’s the author’s fault. For most users, two of the most difficult topics to understand are VBA Macros & Array Formulas. #YodaLearning #ExcelMasterClass has videos which even an Excel beginner can pick up easily, right from the basics of VLOOKUP to 3-D Lookup, Array formulas and Excel VBA Macros. 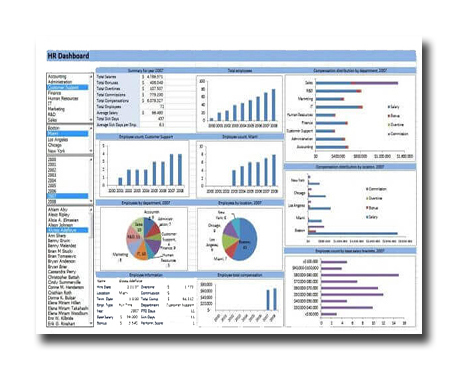 Everyone loves easy-to-learn Excel tricks that has RoI. Did you know you can (1) remove the Excel Worksheet password using just a Notepad – no software download needed, (2) you can apply Machine Learning algorithm for data cleaning based on pattern recognition, and (3) you can Fuzzy Lookup to match entries with different spellings (James, R. Louis vs. Louis Jameson). Our #YodaLearning #ExcelMasterClass brings to you all these tricks and more under one umbrella. Choosing the right Instructor is half-the learning done. Our instructor Rishabh Pugalia is a Chartered Accountant. He has worked with KPMG (Auditor), G.H. Financials subsidiary (Interest Rates Futures Trader) and J.P. Morgan (Debt Capital Markets Analyst). He has taught 4000+ professionals at PwC & EY – two of the global Big Four firms. The experience itself is invaluable. 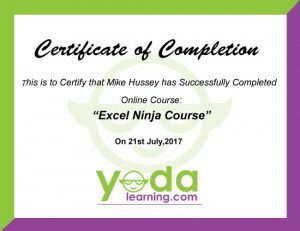 He shares his experience on applying the learning in our #YodaLearning #ExcelMasterClass. We want you to grow fast. If you’re not satisfied with our learning material, please ask for a 100% refund within 30-days with just two mouse clicks. No questions asked. 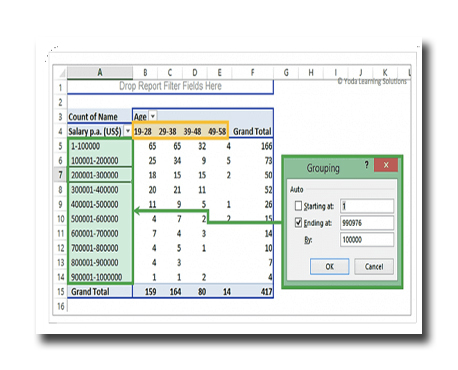 What should you learn in Excel online? You who are proficient in Pivot Table, inter-sheet and inter-workbook VLOOKUPs, basics of SUMIF, COUNTIF, and data cleaning tricks. 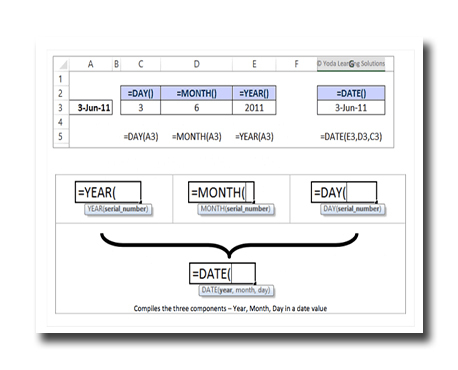 You are looking to learn time saver tricks, expand possibilities, and perform complex calculations. E.g. topics such as Macros, 2-D lookup, reverse lookup, multi-criteria SUMIFS and COUNTIFS, advanced Pivot Table features will be interest to them. They will be keen to learn advanced functions such as OFFSET, INDIRECT, Array formulas, multi-dimensional what-if analysis, advanced charts, dashboard, Macros coding, Power Query, formula based Conditional Formatting etc. You are the Go-To person in the organization for Excel Automation problem solving. They learn faster and wish to keep themselves updated about better ways of problem solving. You will know: How to communicate with other applications to automate task, optimizing code efficiency, userforms, user defined functions. "I would like to tell you that I am very impressed with your courses so far – I particularly like the short videos that allow me to get to a topic quickly and then move on (your competitors mostly offer 20-30 min videos which is a bit much to keep one’s attention span)." "Excellent course. I’ve taken several courses on pivot table before and I can say that this has been the best. Very engaging instructor. The whole concept of data table has become clear to me. I’d highly recommend this course. Looking forward to taking other courses from the same instructor"
3) The diploma can be verified via URL and exported to LinkedIn to boost your career and impress potential employers. Feel free to call us for any query related to courses. Our support team will resolve your issue. Doesn’t it frustrate you that you end up spending a lot of time on Analysis or Presentation-related activity because you don’t know better and faster way to complete the same? There’s nothing more frustrating than – Spending time on creating appealing presentation slides while you could be working on perfecting your speech or delivery. – Performing manual actions like data cleaning or formatting on excel which could be easily solved with combo formulas or VBA macros. And to make matters even worse, you think what you know is enough and what I don’t know is implicitly considered irrelevant and useless from my point of view. The fact you’re watching this video, means you know what it’s like to feel because nothing seems to work out the way you planned. HOW MUCH TIME REQUIRED TO COMPLETE EXCEL MASTERCLASS? This is a self-paced, lean Excel masterclass program with videos from basics to advanced tutorials. Watch the preview of videos tutorials to get a flavor the program’s uniqueness and relevance. Online courses may not be your first preference. But I promise this – After watching 3 videos, this courses will give a tough fight to your usual classroom training. WHAT IF I’M UNHAPPY WITH MY EXCEL MASTERCLASS COURSE? DO I GET A REFUND? 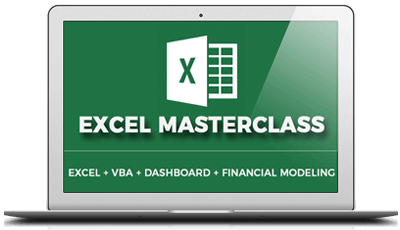 WHAT DO YOU GET IN THE EXCEL MASTERCLASS? – All Advanced tutorials case studies related to videos. – A picture based Excel PDF handbook on Excel Tips, Functions & Techniques. – Access to all video tutorials 24 x 7 – learn excel online from anywhere. – You will also get support for doubt and assistance to implement your learning in real-life challenges.